One of Gżira’s few and oldest historical monuments will soon be on the point of collapse, as a result of years of neglect. Known to some as Sliema Gate, it was constructed in 1796 when the road from Msida to Sliema was “widened for the commodity of the public and private entities through the initiative of Fra Nicolaus Butius” as can be read from the now severely eroded inscription. The archway is crowned with the coat-of-arms of the Testaferrata family, owners of the surrounding estates. Sir Temi Zammit in his book about Sliema and St Julians published in 1930 described this as “a beautiful stone gateway”. It has been said that the structure was dismantled and relocated to its current position to accommodate further infrastructural improvements, sometime during the last century. Although still privately owned, the Malta Environment and Planning Authority should get involved by first scheduling the gate and then making funds available for its immediate preservation. A past restoration attempt has had detrimental effects on the masonry, resulting in its rapid decay. Besides the inscription, sadly so are the coat-of-arms and finials now practically lost to erosion. More ominous, however, is the rising damp now eating away at the lower voussoirs of the arch itself threatening the monument’s entire structural stability. Fortunately old photographs exist clearly showing the sculptural detail of the gateway. Ta’ Xbiex lost a similar ornamental gate in 1989 when it was shamefully bulldozed in the name of development. 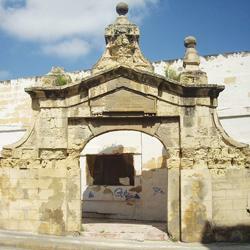 It is therefore imperative that Sliema Gate does not suffer the same fate as a result of wanton neglect. Restoring this monument should come at no great cost. Perhaps some of the many nearby business establishments might be willing to sponsor the works? The Sliema Heritage Society is willing to offer any help it can give so as to ensure the preservation of this monument. It is also compiling a database on the archway’s history which may be of assistance to those carrying conservation operations and appeals to anyone with any relevant information to contact the society on sliema.heritage.society@gmail.com.